When I was a kid I wasn’t a picky eater. My Dad would boast to other parents that “I would try anything” “There’s nothing this kid doesn’t like” and “She’s not picky at all.” This was pretty true for the most part. Well at least to his knowledge. I mean there were things that I didn’t particularly care for, like stew, but as the eldest child I would dutifully eat it to show my mom what a great child I was compared to the three twits who were ignoring their stew and who didn’t seem to care that if they didn’t eat the stew they weren’t going to get a biscuit and would go to sleep with their stomaches growling. I wasn’t willing to take that chance. Eventually all of the dutiful stew eating allowed me to have my biscuit with my stew and not after. A reward for not being a picky eater. Now this continued even as I got older; my dad took great pride in what a fabulous eater I was. So when I first spent the night at my Iranian friends house he brightly told the parents that they would have no trouble feeding me as I smiled and nodded my head and reiterated that I wasn’t a picky eater at all. Oh no I wasn’t a picky eater at all and I was up all night with the diarrhea to prove it. Ashamed that my stomach couldn’t handle the spicy vomit next to my head and a lot of panicked voices speaking a language I didn’t understand. All of this probably had more to do with the fact that I had eaten extremely spicy Indian food immediately after a soccer game in the heat and less to do with the Persian food they fed me later, but it was still extremely embarrassing. Anyways I don’t think I ever told my Dad about all of that because I knew part of the boasting was to inform others that I wasn’t going to inconvenience them with my eating habits. Little did we know that I was going to inconvenience them in a whole other way, a much worse one. The point is that food has been a huge part of my life, more particularly liking food, or at least trying to like different foods has been a huge part of my life. It has been a challenge to myself to try foods that I’m not accustomed to. A pretty hilarious one at points. I once spent the entire Thanksgiving afternoon popping green olives into my mouth because I knew I would like them after I got over the initial pucker. One jar of green olives later, I had finally gotten past the scrunching my face up and shuddering and I came to find that I really did like green olives, a rare quality to find in most eleven year olds. Heck, this past Thanksgiving I tried to convince myself that raw cranberries wouldn’t be that bad either. That unfortunately didn’t turn out quite like I planned and I have to say I’m pretty glad that my mum’s phone crashed and the video of me spitting one out consuming one is long gone. 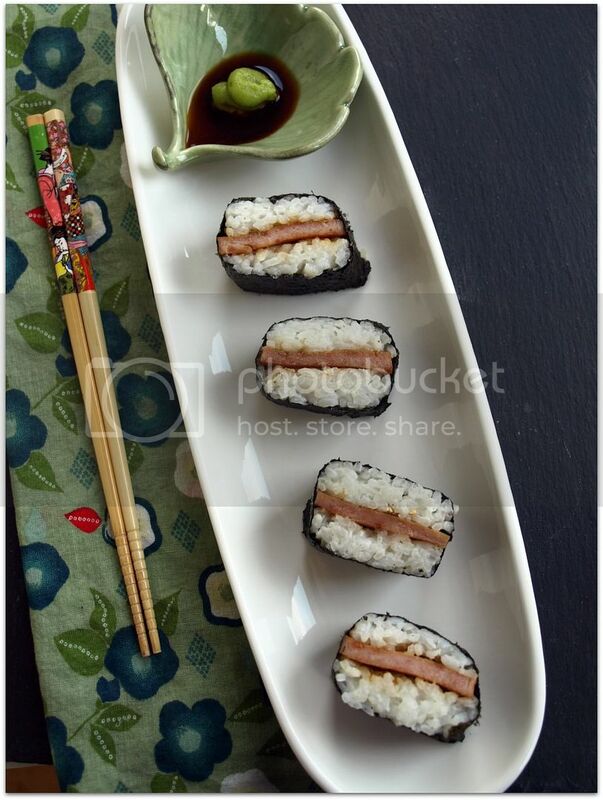 SO, I know that you want to boast about your tastebuds but I don’t think you can unless you try spam sushi. I know what you are thinking and hey I was thinking it too when my friend offered it to me at a party. And then I asked for the recipe. Oh and you know if you want me to try something weird to justify your spam eating just tell me in the comment section because this kid isn’t afraid of anything. *You should be able to find all these products at your local Japanese market (if you are lucky enough to have one located by you) or Amazon. This all about your taste buds. That's why I didn't give measurements. Experiment and have fun. If you can't have fun with this recipe, I'm not sure you can fun at all. In a bowl, mix soy sauce and sugar until the sugar dissolves. The amount is really up to you. Do you like it more salty? Add more soy. More sweet? Add more sugar. Try a half cup of each and go from there. In a frying pan, brown the spam for a minute or two. Add some of the soy sauce-sugar mixture. Cook until crispy on the edges and warmed though. 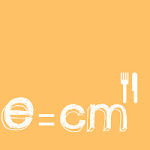 Transfer to plate. Wipe down pan and repeat until all the spam is cooked. Lay the musabi mold on top of a piece of nori. 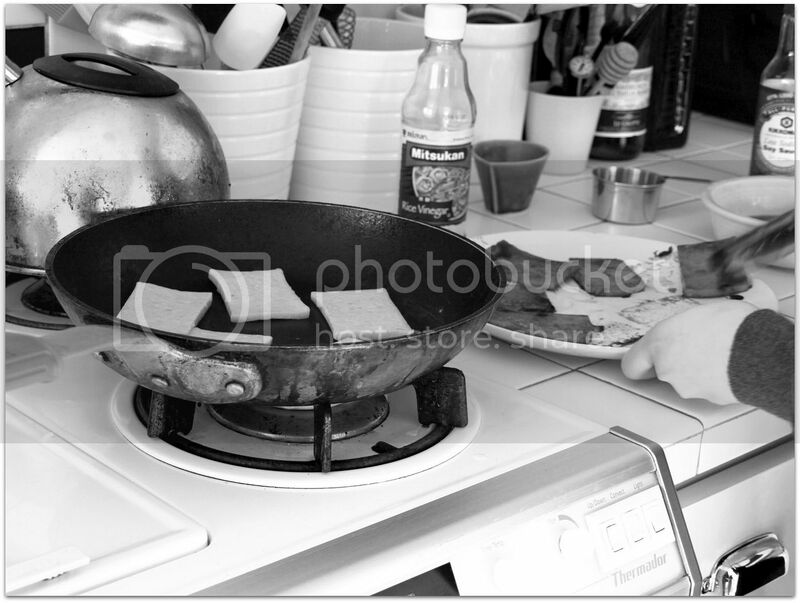 (Ours was large rectangular musabi mold) Scoop a mound of rice and place in into the mold. Using the musabi rice press, press down hard on the rice so it become flat, even, and compact. I cannot put emphasis on that. 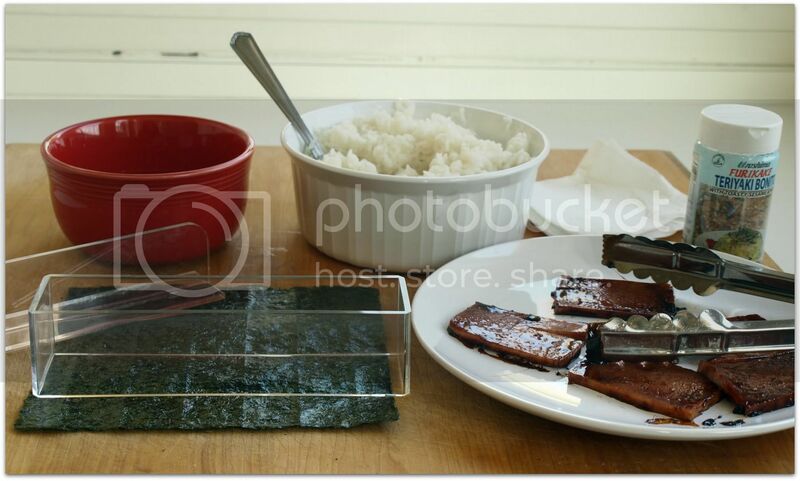 Falling apart musubi is not what you want. Sprinkle a thin layer of furikake over the rice. Then add the Spam. Then another layer of rice. 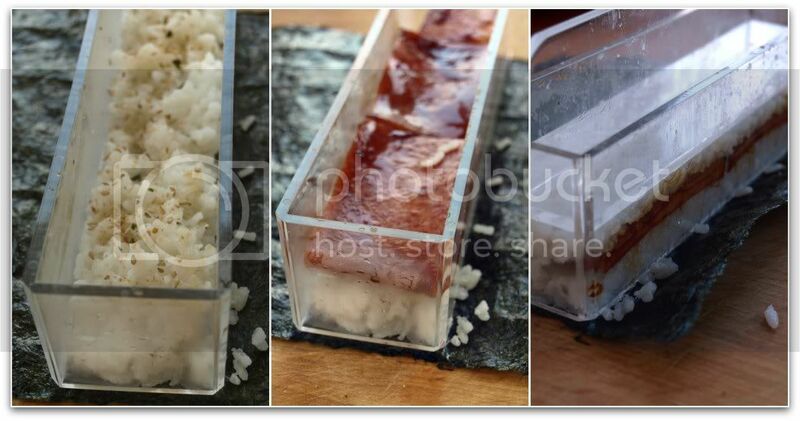 Again using the rice press, press down on the layers of rice and Spam to make a nice compact rectangle. Remove the mold by holding the handle down with one hand and using the other to pull the mold upward, unleashing the musubi. Dampen the edge of the nori with water and fold over about a quarter inch or so on the rice to create a seal. 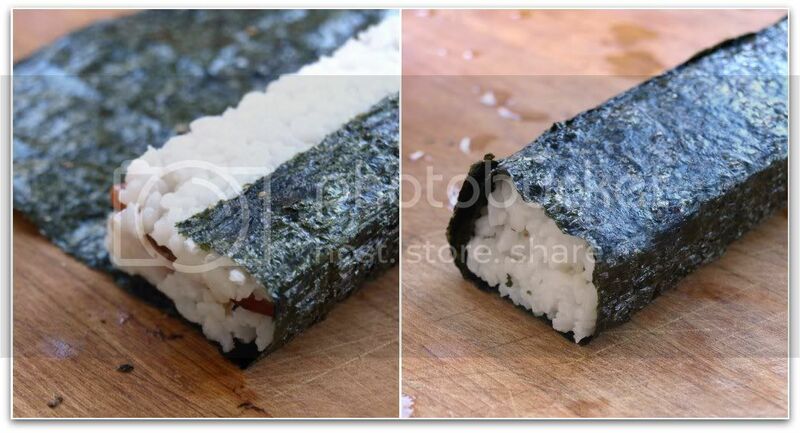 Then tightly roll the nori around the rice mold until completely wrapped. Use a little more water to seal the nori. Using a serrated knife slice into pieces. And there you have it. Easy peasy. 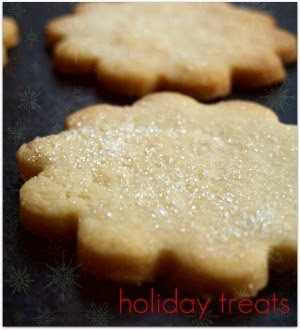 Salty, sweet, a little crunchy, addictive. I never had a problem with spam. Occasionally someone would fry it for breakfast, broken up and tossed into rice with a fried egg on top. I never made it myself though as I would rather buy ham than a can of spam. 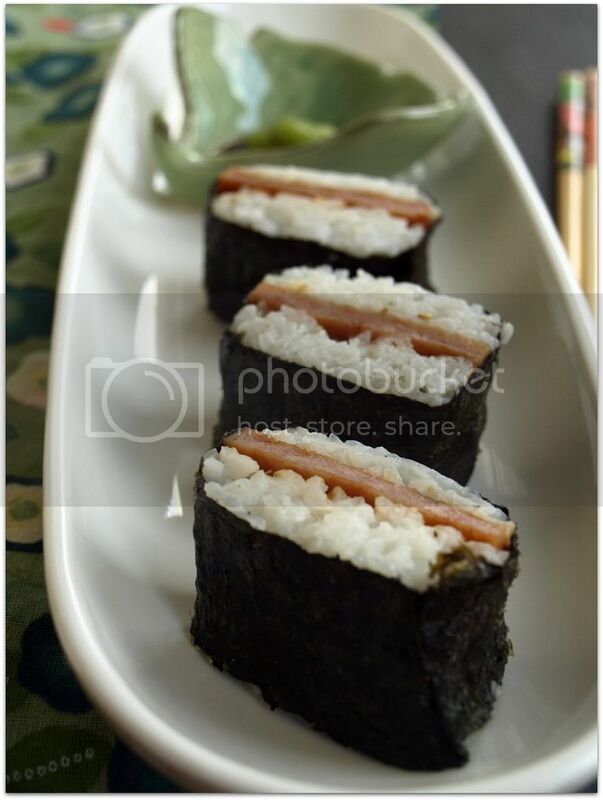 But then my aunt made spam musubi and it is sooooo good!! She made it more simply, the nori, then the fried spam, a little brushing of bbq sauce, then rice. She would just wrap it up from there and you had yourself a ready to go snack. I was reading this and even though I clearly stated that Katie was guest writing, I thought it was you. The three little twit parts could be you writing too... funny! Cool post, now I'm going to have to make bacon jam and spam sushi! amanda... i never thought of bbq sauce... i bet that would be yummy. stacey... we look alike and write alike... weird. Katie, I have a Japanese market right nearby. Many. I could make this... but I'd be eating it on my own. Maybe I'll wait for a party. Or maybe I'll just go grab some at a local Hawaiian barbecue. Either way, I'm down with the spam musubi. And kudos to you for continuing to be adventurous! Katie- I do believe you just called me out. I'll try it. Yes, I am apprehensive, on account-a the fact that I've never liked Spam in any of the forms I've eaten it... But I'll try it this way. In fact, it kind of sounds good. P.S. How about a little bacon jam in one of these rolls? You almost have me convinced to give it another shot. Almost. Great post, Katie. You do write like Krista! I'm like you, never a picky eater, willing to try anything. And I happen to love Spam and Big Macs as much as I love artisenal cheese. 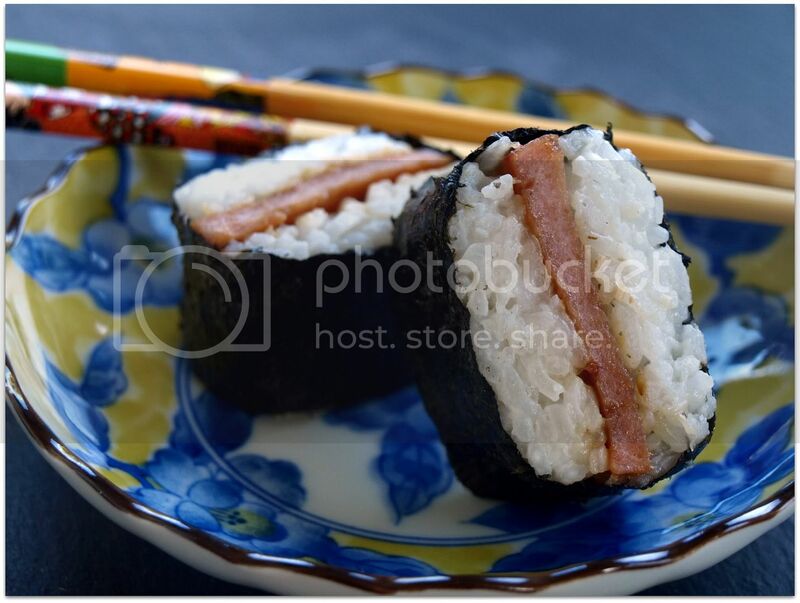 Your spam sushi looks soooooo good. This sounds really good, but then again I grew up eating fried bologna sandwiches. I so love SPAM. Have you tried Bacon SPAM? Sigh. And SPAM Musubi? Heaven! I love working near Japantown..the coffee shop down the street sells SPAM Musubi as well as the Hawaiian place nearby! Honestly, it doesn't sound all that gross or weird to me. I'd eat it. Nice post! I am not a spam lover...I live in the corporate headquarters for spam. So it's been shoved at us from all kinds of angles (Hormel wanted to call our cheerleading squad the spamettes and we declined, but some nice ladies took the name and sing at their festivals). Pizza, hotdishes, stir fry, with eggs, and might I add they have all sorts of flavors. Now saying that...I would probably try this. 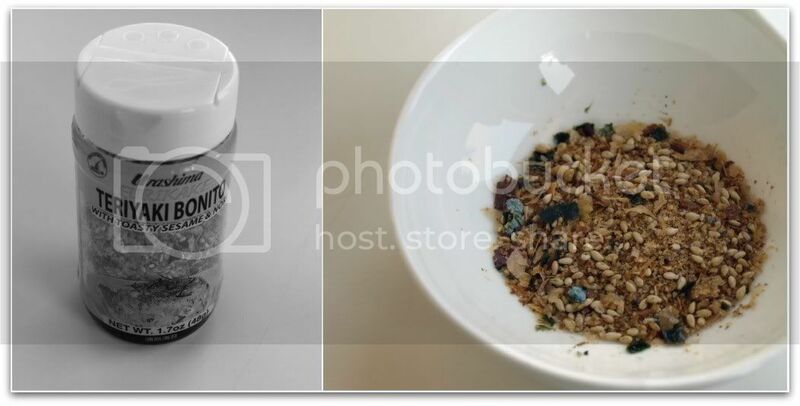 I just don't know about that mold ingredient lol. LOL at calling STL out on the cured duck... hahahhaha. hmm... i may use this as my introduction into making sushi as the idea of working with raw fish makes me nervous. And then you asked for the recipe.